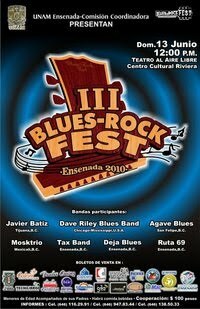 Sunday - June 13, 20103rd annual Ensenada Rock & Blues Festival at the Cultural Center Ampitheatre. Music, food, fun and more! Don't miss this one. More information call 646-947 8344. See ya there!